If you’re reading this from Kentucky or the mid-west, you know it’s dry out there. Here at the home place we have gotten a little rain, but it is still pretty parched. A couple of weeks ago, if you had seen a picture of my bee yard, you might have imagined that it was October – grass brown and fallen leaves on the ground. Of course, if you were standing there in person in the 95°F heat, you would not have been fooled. Since then, we have received a couple of inches of rain. That has been a relief, though I could for more, but at least I am seeing some green in the yard. I’m also making a real effort to keep water in my “bee waterer”, which is seeing a lot of traffic lately. 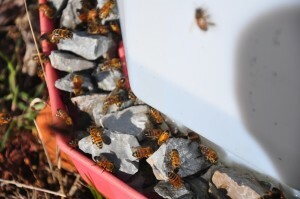 If you’re interested, you can view a video clip of my bees at the watering station. Fortunately, my neighbor across the road doesn’t have a swimming pool up this summer, but I am concerned that my girls are making a nuisance of themselves at someone else’s pool party. If you don’t have a water source for your bees, consider setting one up for their sake and the neighbors’. This is especially an issue for those keeping bees in town or suburban areas. Bees searching out water, not only at swimming pools, but also at bird baths, hose or faucet drips and pet water bowls, is a major cause of beekeeper/neighbor conflict. 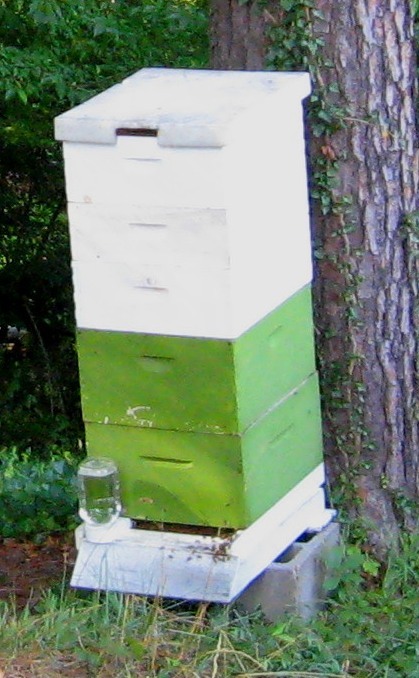 While the Kentucky state apiarist, I once had a phone call from the wife of a former Kentucky governor, asking me what she could do about her cousin’s bees that were coming to her swimming pool! Her beekeeper cousin happened to be a friend of mine, and I really wanted to stay out of that family disagreement. Chicken waters with gravel in the trough work well. Make sure you rinse off the gravel first. I have a large one, which has the advantage that, when I have it adjusted properly, it only needs refilling about once every two weeks. An inclined pan with gravel or sand works also, you need a reservoir at one end and a beach, where the bees can collect, at the other end. 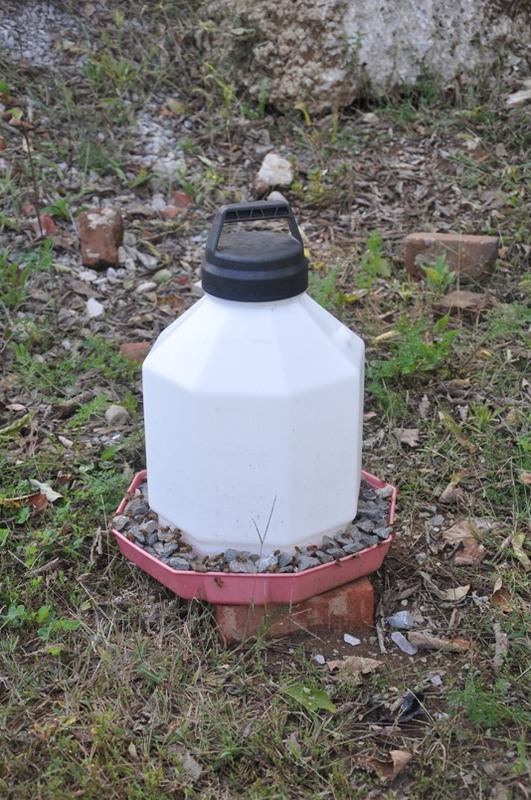 For those with just a few hives, entrance feeders with water in the jars is another option. 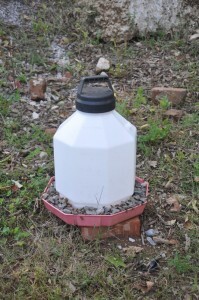 I suppose you could put water in any type of feeder; the important thing is to keep them filled. When you stop, the bees will go elsewhere. I’ve heard that adding a little salt to the water makes it more attractive to bees, but I haven’t tried it myself. Whatever method you use, if you have neighbors (and most of us do), keep some water out for the girls. This entry was posted in Hive management. Bookmark the permalink. We keep a sponge in our birdbath for them.